What makes music Romantic? Like beauty, Romanticism is in the eyeor earof the beholder. As a musical movement, it is generally associated with nineteenth century Europe though the Romantic movement actually originated in Germany. In this exquisite trilogy of romantic classical music, The Romantic Approach explores the origin of music Romanticism, French and Italian romantic music, and 20th century American romantic music written after the end of the Romantic era. The first volume in this trilogy, The Romantic Approach: A Special Collection of 20th Century American Music (13087) may have surprised listeners who felt that contemporary America has produced very little Romantic art. The diverse roster of this century's finest composers also reflects the diversity in the music, from jazz influence to classical. This collection of works echo the lyrical, tonal style of European classical music of the nineteenth and early twentieth centuries. The Romantic Approach, Volume Two: A Special Collection of Classical Music from Italy and France (13101) showcases the very heart of Romantic literature. Of all the countries in the world, France and Italy have been those most associated with things romantic; even the sounds of their languages are musical, and that songlike quality has certainly colored much of the music of these two countries. Some of the works and composers on this volume will be familiar to opera lovers, a central part of the musical life of these countries. It is rounded out with unjustly neglected masterpieces from several gifted French and Italian composers. 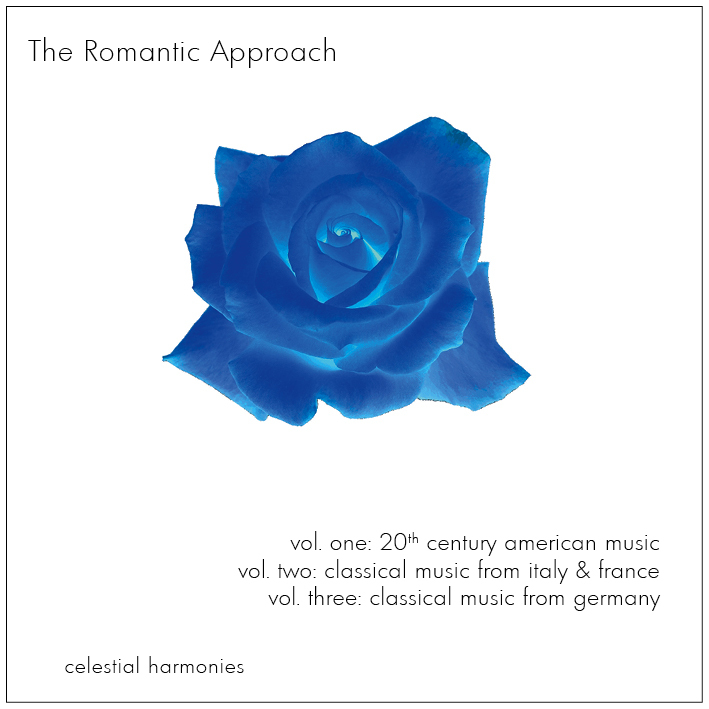 The Romantic Approach, Volume Three: Classical Music from Germany (13162) takes us back to the origin of the Romantic movementto Germanyand to the emotional works of its greatest composers. These composers could move their listeners without having to resort to painting a particular image in sound. This is music that can speak to the emotions without dictating which emotion you should feel; in fact, it can evoke a different vision or story in each listener. The first volume in this collection features the following American composers: George Gershwin, Duke Ellington, Leonard Berstein, John Cage, Elliott Carter, Henry Cowell, Aaron Copland, Peter Schickele, Arthur Foote, Samuel Barber, Ferde Grofé, and Charles Ives. The second volume is this series is represented by some of Europe's finest composers: Pietro Mascagni, Claude Debussy, Jean Francaix, Gabriel Fauré, Gioacchino Rossini, Antonio Vivaldi, Ottorino Respighi, Giacomo Puccini, Giuseppe Verdi, Giuseppe Martucci, Jules Massenet, Maurice Ravel, and Erik Satie. The third volume in this series features a selection of romantic works by these great German composers: Ludwig van Bee-thoven, Carl Maria von Weber, Felix Mendelssohn-Bartholdy, Max Bruch, Robert Schumann, Johannes Brahms, and Richard Wagner.